1131 11th Pl S, Birmingham, AL.| MLS# 808304 | Richard Jacks UABLIVING.com 205-910-2297 | Birmingham AL Real Estate | Contact us to request more information about our Homes for Sale in the Birmingham AL area. *ADORABLE* *UPDATED* & *CONVENIENT to UAB* FRESH PAINT throughout and NEW CARPET in the bedrooms. 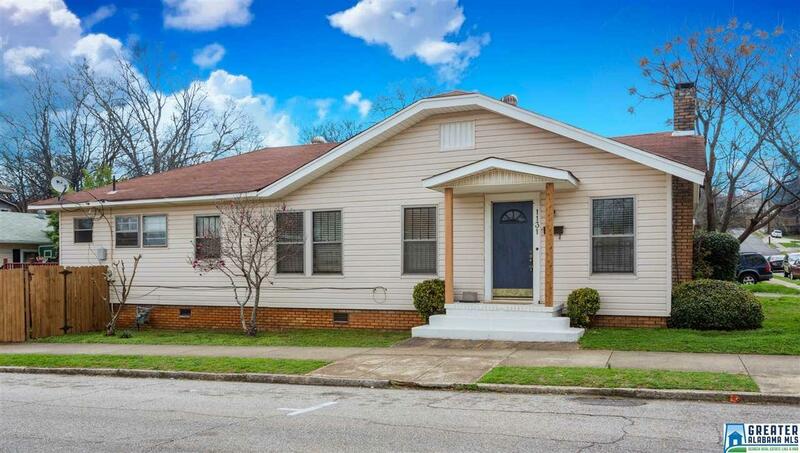 This home is on a CORNER LOT and is a short walk to the new Saw&apos;s BBQ location. Tons of NATURAL LIGHT, a charming fireplace, and beautifully restored HARDWOODS in the LIVING ROOM. Fantastic SUNROOM at the corner of the house will make terrific den or office. Formal DINING ROOM has enough space for table and buffet. Roomy KITCHEN has an eat-in area, pantry, and appliances that will stay with home. Handy LAUNDRY ROOM has plenty of shelves for storage. BACKYARD is a great extra with a privacy fence and freshly painted deck to relax on. Insulation has been added in the attic and under the home as well to make this home very ENERGY EFFICIENT. Add DRIVEWAY PARKING and LOW MAINTENANCE vinyl siding and this home is a smart purchase for a savvy buyer. Driving Directions: From 20th Street, Go West On 11th Avenue South. Take Left On 11th Place South At Glen Iris Elementary. It Is The Cute House On The Corner Lot At End Of Block On Left.